10 Meatless Monday Recipes You Can’t Live Without! #MeatlessMonday started as a trend but is sticking, thank goodness! If you search my blog you will find lots of meatless meals to choose from. It’s always amazing to me how we can enjoy so many satisfying & filling meals without the meat. Here are some of my favorite recipes. I hope you enjoy them too. If you cook something from this list snap a photo and share it with us on Instagram… be sure to tag me @marlameridith so I don’t miss it. Chipotle Black Bean and Cheese Taquitos No meat needed in these tasty, filling taquitos. Bet your kids will love them too! Spaghetti Squash with Roasted Tomatoes and Garlic Not only is this tasty dish meatless, but it’s gluten free and grain free as well. Vegan Cream of Kale Soup Eat your veggies with this super healthy soup. Vitamin rich and perfect for warming up in the cooler months. Italian Chickpea Salad This beauty requires no cooking at all. Very helpful after a long day at work and you want to stick to a healthy meal plan. Veggie Buddha Bowls with Cilantro Avocado Dressing These bowls are chock full with great for you ingredients. Don’t be shy with the avocado dressing, it’s one of my all time favorites! 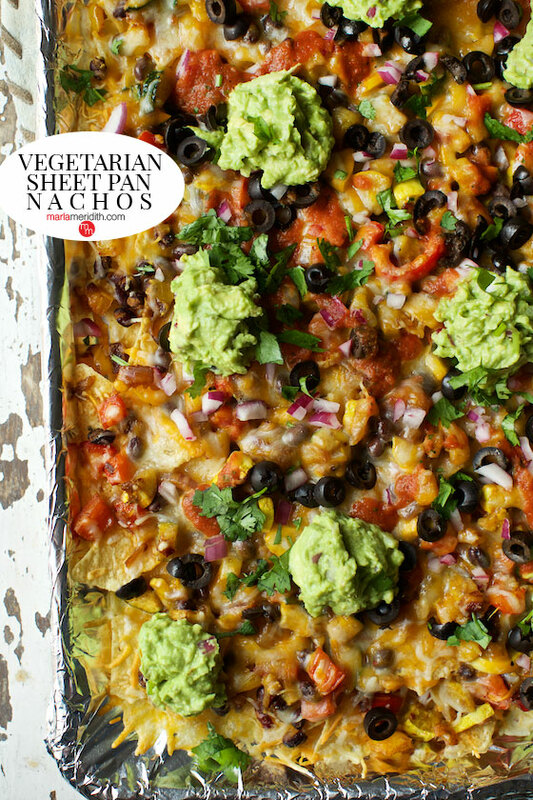 Vegetarian Sheet Pan Nachos Skip the meat, the toppings on this are all you’ll ever need. Great recipe for game day too. Requires minimum fuss to prepare. Steamed Veggie Dumplings with Ginger-Soy Dipping Sauce Skip the takeout and make your own dumplings. You will be so pleased with how much better they are when made in your own kitchen. Balsamic Grilled Vegetables Serve with some pasta, rice or quinoa and a hunk of cheese for a full meatless meal. Chipotle Avocado Toast is great for any meal of the day! Vegan Split Pea Soup This warming soup screams great for you in every way, it’s gluten-free too. These recipes are all perfect for meatless Monday! I’m especially loving the avocado toast and nachos (of course!). I can be meatless everyday with food like this!